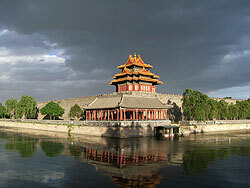 Beijing's second largest area is Dongcheng District (a prime area), site of many famous Beijing landmarks such as the Forbidden City, Tiananmen Square, the Dong Si Mosque, and the Beijing Drum and Bell Tower. Dongcheng's large number of monuments, museums and ancient relics, remind visitors just how deep Beijing's history is. With Mao's Mausoleum and other great landmarks in its backyard, Dongcheng is full of tourists. Major hotel chains have taken up residence, and there's a sprawling high-end shopping street, Wang Fu Jing. Those looking for something different often visit the Donghuamen Night Market. Packed with locals and visitors, it offers vibrant lights and delicious smells, and snacks from chicken on a stick, to exotic delicacies such as silkworms, goats eyes and scorpions. Dongcheng District has its share of hutong neighbourhoods. The hutongs in this district are lined with quaint shops, lofty trees and are (of course) one story courtyard homes built of gray brick. The home of rich merchants prior to the arrival of Communism, Dongcheng's hutong neighbourhood is so popular that the administration has renovated some hutong areas, and added signs in Pinyin (Romanized Chinese) to help identify different residences, and help visitors manoeuvre their way through.